The plaid and cowboy boots swapped to black band T-shirts and tennis shoes Saturday night at the Missouri State Fair. The sound of steel guitar and fiddles was replaced by down-tuned electric guitars and blistering drum work. It was a bit disconcerting that in the minutes before Sevendust took the stage, ushers were walking through the aisles telling fans “Don’t fold your chairs up, it’s for your safety.” I didn’t expect the crowd to be too rowdy for Halestorm, but I was expecting a bit of moshing for Sevendust despite the chairs in the track area. As the band hit the stage the audience was immediately on their feet, fists and metal horns held above their heads. Throughout their set, Sevendust lead singer Lajon (LJ) Witherspoon was constantly interacting with the crowd. He’d ask “Are you with us?” to a chorus of screams or get fans moving by yelling “bounce” into the microphone and bouncing his hand as the crowd bobbed to his rhythm. Early in the set, Witherspoon said that playing the Missouri State Fair was like a homecoming for him. He recently moved to Overland Park, Kan. and said some people there thought he was a Kansas City Chiefs football player. He drove the point home as he held up a sign from someone in the front row that read “LJ you are my favorite Chiefs player.” Before going into the next song, Witherspoon pointed out his daughters who were visible on the right side of the stage, metal horns in the air. Witherspoon kept asking the audience if they were ready for Halestorm, which garnered a cascade of screams from across the crowd. “We’ve been hanging with those guys since they were like 10,” he said into the mic. After their performance, Sevendust received a standing ovation from the crowd that turned into a couple minutes of a “Sevendust” chant. 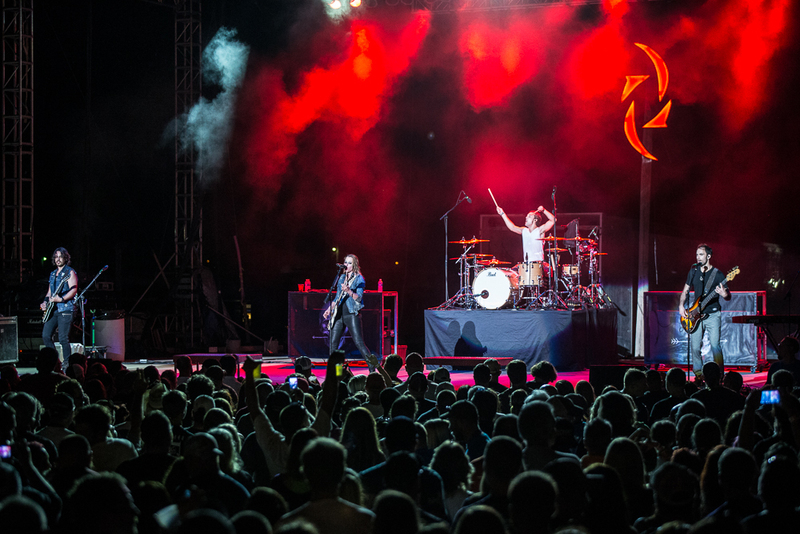 The band’s aggressive style really amped up the crowd and readied them for Halestorm. As beer flowed Saturday night, fans stood and held homemade signs high for about 20 minutes before the lights dimmed and Halestorm hit the stage. The four-piece band came out and jammed for a couple minutes before going into their first song. The fans were whipped into a frenzy by the second song – headbanging, singing and screaming along. Throughout their set, a group of men behind me would all yell “I love you, Lzzy.” A couple of times she responded “I love you too,” over the microphone. The group’s ‘80s influenced sound really came through during the set, which featured a cover of the late Ronnie James Dio’s “Straight Through the Heart” and Fleetwood Mac’s “Gold Dust Woman.” The band’s signature sound features a lot of ballads and guitar breakdowns reminiscent of “hair bands” 25 years ago. About midway through their set, Lzzy, guitarist Joe Hottinger and bassist Josh Smith moved off the stage to give the limelight to their drummer, Hale’s younger brother Arejay. He put on an explosive solo performance that had the crowd revved up. During his surprising performance, Arejay stood up and hopped on his seat while maintaining his rhythm. Late in the solo, he asked the crowd if they wanted to see something “really big.” As the crowd cheered, he produced two giant drumsticks, they had to be about three feet long and as big around as a quarter and continued his solo. This was my favorite concert of the 2014 Missouri State Fair. I may be a little biased as Sevendust was the first concert I’ve ever seen so they have a special place in my heart. They did a great job of getting the crowd ready with their heavy sound. The squealing guitar, thundering drums, and gritty vocals makes for a visceral performance every time Sevendust is on stage. Halestorm was a bit surprising as well. I’m not a huge fan of their albums, but the band has amazing energy on stage. The Hale siblings definitely know how to work the crowd, Lzzy was constantly waving, winking and talking to the crowd throughout the set and Arejay’s antics behind the drum kit were a sight to behold. It was a really great show and the perfect way to close the Grandstand.